The story of Asian knotting begins at the same time as recorded history, since knots were used before writing to record events. literature, such as the Dao de Jing, the Yi Jing, Yi Zu, and the Tsui Chronicle. One of the few places where knotted records are still made is on Okinawa, here in Japan. This quote is from the Dao De Jing, chapter 80 as translated by Wing-Tsit Chan in A Source Book in Chinese Philosophy, P175. Looking for "warazan" which is the name of the images above, I came across this page which is clearly talking about both warazan (Okinawan knotted records?) and quipu. In Japanese. Another link to help your research, The Ethnomathematics Digital Library (the rabbit hole gets pretty deep pretty quickly, eh? 8). 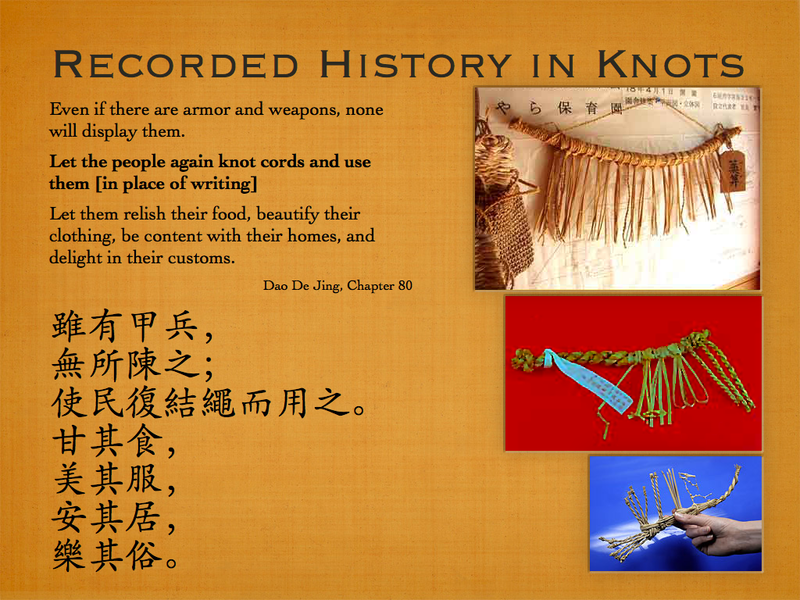 A khipu blog (khipu == quipu) that regularly references Chinese knotted records.